Phuket : No Culture and No History? Really? 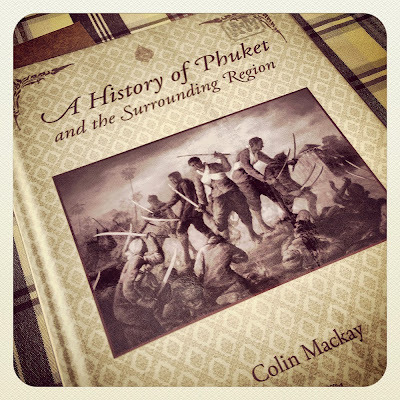 (above) Last year a book was released called A History of Phuket - great book! Great reading if you have an interest in Thai history. I have read it twice and will read again! Phuket has a long history as a port and as a waypoint for traders going between Arabia and India to the west, and China to the east. Phuket was an important trading post before any Europeans arrived. The first Europeans only found this part of the world in the early 16th century. Phuket went through periods of Arab, Indian, Portuguese, French, Dutch and British influence. There was once a French governor of Phuket and there were Brits living here in the 18th century. Indeed the British were on the verge of taking Phuket in the early 19th century after conquering Burma, but in the end Britain took Penang instead as it was closer to the important straits of Malacca, leaving Phuket island (then called Thalang) as part of Siam. Oh yes, history is here! The mix of people passing through Phuket over the centuries does create a unique melting pot of cultures, peoples and religions. In Phuket Town you can find Buddhist temples, Chinese shrines, a Mosque, a Catholic church, a Sikh Gurdwara, a Hindu shrine and probably more! It's a sign that Phuket has been on the map for a long time. Phuket was important a long, long time before any tourists came to enjoy the beaches. If anyone imagines that Phuket has no history or culture, think again! It's had a lot of blog space over the years. 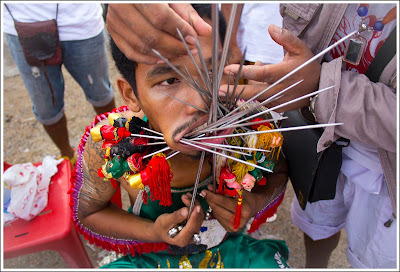 I never attended any vegetarian festival events or street parades until 2006 when I started the Phuket blog and decided to find out more about this event. It's huge. A 10 day festival with crazy street processions featuring bizarre piercings, entranced spirit mediums, a lot of firecrackers and a lot of history. It's my favourite time of year in Phuket, and I'm not even a vegetarian! 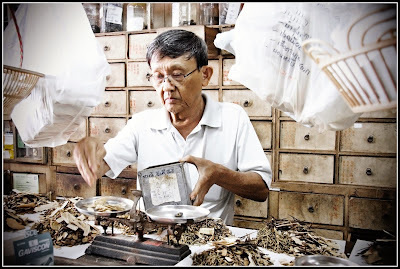 The festival has Chinese roots and began sometime just after 1825 when visiting Chinese got sick in Phuket and cured themselves with a cleansing diet. Well, that's the story. Later, Phuket locals sailed to China to discover more. Also called the "9 Emperor Gods" festival, it's quite wild, but if you stay by the beach you really don't see much. 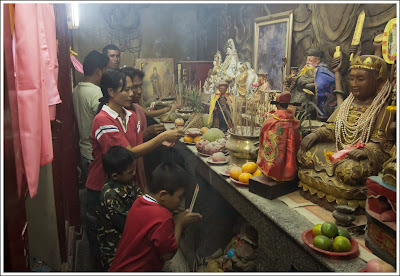 It's centered in Phuket Town, with some Chinese shrines in other parts of the island also participating. A couple of photos and a few links below to help explain more. The festival is also found in other parts of Thailand, but Phuket is where it started and if you really want to see more, it's not for the fainthearted! 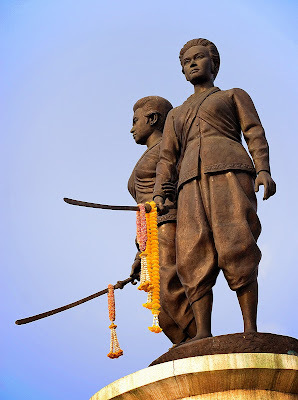 (above) Statue of the Heroines of Thalang - there is also an annual festival to celebrate the victory over Burma in 1785. Thalang is now the name of the town in the middle of Phuket Island south of the airport. 200 years ago this was the main town on the island. Nobody seems to mention that the Burmese came back 20 years later and won a victory over the people of Thalang. The Burmese were finally chased from the area by the British in the 1820s. 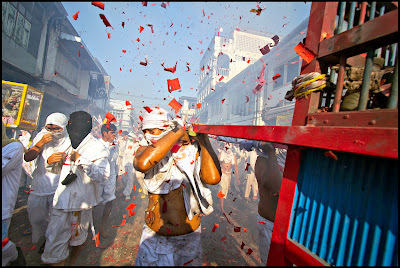 I have enjoyed discovering more about Phuket culture and first investigated the Por Tor Festival in 2011. 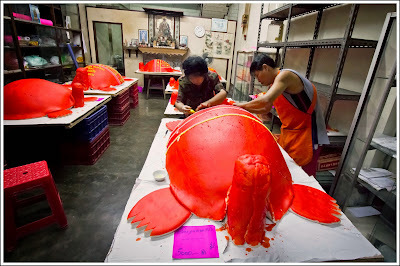 It's another festival based on Chinese beliefs although it seems very specific to the straits of Malacca. There is something similar in Singapore. A family member from a Chinese-Thai family in Bangkok who visited the festival with us last year did not know about it. In English they call it the "hungry ghost" festival and the belief is that in the 7th lunar month, the hungry ghosts of ancestors visit our world. So they need feeding! Thalang was the main population area if you go back 200 years or more, but there's hardly a sign of any old buildings there as almost everything was was wooden, or destroyed by the Burmese in the early 19th century. Phuket Town became more important due to the tin mining boom which existed as far back as the 18th century, but became huge in the latter half of the 19th century. Many of the open pit tin mines were in the south of the island, and a port and town were built with a wide canal extending from the sea at Sapan Hin through the town and several kilometers further in the Kathu tin mining area. The "Bang Yai" canal still exists, but is only navigable for a short distance. Much of the "Old Town" was built in the late 19th and early 20th century. Rich mining families built mansions, there was a school teaching Chinese, a hospital was built and the first bank in Phuket was built in 1907 (the Standard Chartered Bank) with a police station opposite for security! The Old Town was looking rather shabby for many years - certainly when I got here in 1999, it was really quite crumbly. But over the last 10 years a lot of effort has gone into the Old Town, businesses have opened, plenty of paint has been used, there are regular festivals and a good number of cafes, bars and restaurants. It's my favourite part of Phuket! Again, something I knew nothing about until a few years ago. Phuket started promoting something called the "Baba Wedding", a little festival which was all about the Baba (local name) or Peranakan culture - people descended from Chinese and local Malay citizens. 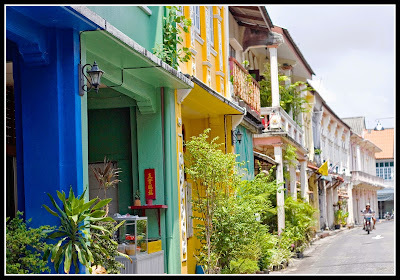 You can find the Peranakan culture in Singapore, Penang, through the straits of Malacca. Such people are also called "Straits Chinese". In the 19th century there was huge immigration from southern China to this area. New arrivals met locals and married. Their offspring were called baba (male) and Nyonya (female). 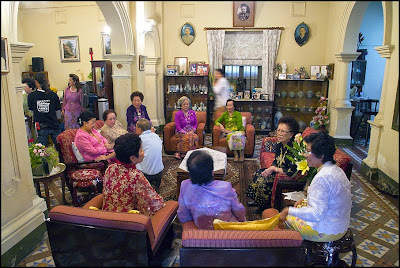 Many of the big Phuket families and also big families in Penang and right up the west coast of Thailand are Babas. I went to the Baba Wedding event for the first time in 2010 and managed to get admission to the Hongyok House. The Hongyok family is one of the big Phuket families. Being in that house was quite a buzz. A lot of history there. Last year (2013) I was able to find time to attend the opening ceremony and street parade for the Baba Weddings in the old town (you might notice, a lot of this cultural stuff happens in town, not by the beach!). It's very interesting to have a unique culture right here in Phuket, and I am glad that the culture is now being better promoted. Did I mention that Phuket has a long and interesting history? Well, it happens that there are several museums in Phuket. The average beach tourist is unlikely to visit, but I hope a museum might be on the list for a Phuket Blog reader! Maybe not all, but pick one .. or two on a rainy day. They are all pretty good and don't have high entry fees. 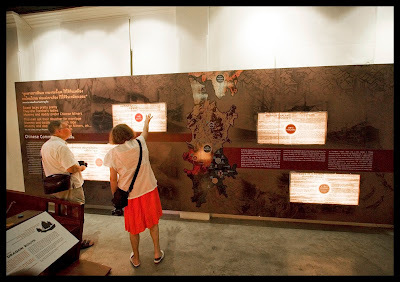 (above) My Mum and Dad checking out some Phuket history at the Thai Hua museum in Phuket Town. It's built in an old Chinese school and really is worth a look, very well presented and a lot to learn! 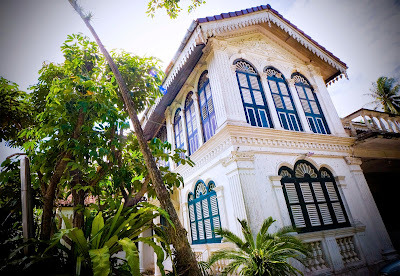 (above) Not far from the Thai Hua museum is Chinpracha House, a mansion built for a rich Chinese family about 110 years ago at the height of the tin mining boom. The owner has opened the ground floor to visitors and it's a fascinating look into the life of the "upper class" in those times. A great way to explore the old town along with Thai Hua and Chinpracha is with Phuket Heritage Trails if you want to learn about Phuket's history! There's more here that could be mentioned, I suppose that depends what counts as "culture". There are foods that are very local - a couple of restaurants where you can get good local food are Kopitiam on Thalang Road in the old town and Tunk Ka Cafe on top of Rang Hill, on the north side of town. Or try Laem Hin Seafood for local seafood dishes, especially local salads made with fish roe or dried shrimps. There are local festivals worth visiting such as the Chalong Temple Fair which takes place around Chinese New Year or the Kathu village cultural fair - date varies, sometime in July or August. And of course Phuket takes part in all the big Thai festivals like Songkran (on April 13th) and Loy Krathong (which is sometime in November - date varies every year). Phuket has no culture or history? Think again, but it has to be said, you're not going to find it on the beach! I do hope that this blog has encouraged people over the years to explore Phuket and the surrounding area. I have no problem if you are coming to Phuket for the beach, a cold beer and a good time, or to play golf or to scuba dive or just to relax at a 5 star resort. I'm just saying ... there is a lot more to Phuket than all of that. Tourism is just the latest episode in the history of Phuket. The mix of old and new, I love it. Phuket is my home and I hope to keep this Phuket Blog going for many more years, trying to show another side of the "Pearl of the Andaman". Enjoy the beaches, enjoy the food and the shopping, have a nice cold beer on a hot day in winter, and do try to find time to glimpse some of old Phuket. History and culture, it's right here! You have been reading ... Phuket : No Culture and No History? Really?